slot car bug has bitten me!!! Thanks for letting me join in last week at johns. You shell be seeing a lot more of me at the club meetings. Met up with John & the lads last Friday for the first time, after meaning to for the past three years. Why did I wait, what a blast. Very hospitable crowd, was a fantastic night in a relaxed atmosphere, well worth the journey through the Nudgee-Deagan carpark. Just joined the group last Friday - 6th June. Had a great night - enjoyed the racing and the company will be back on the 20th. I am building my own track a 3 three lane board track about 25m long - may need some assistance soon to assemble the track and on how to do the landscaping. Hi everone, I have been racing at NBS for a while now and thought it was about time I register. It also gives me another way to stir Trent. See you all friday night. Hi, here is Megan Belle from Australia. Hopefully it'll nice to be here. !!!!!!!!!! Anyone from Brisbane here ???? Been into slots for a long time now and have spoken to a few of you over on Auslot (same user name) from time to time. I did have a routed SSD track a few years ago when we were down the Gold Coast, sold it to a Brisbane guy but lost contact with him. Intro threads ... Do pickup lines ever work ? Bought a scalextric set for my son ... loved it, so does he, we play it ever day when I get home from work. He calls them Daddy's cars, something I need to stop or the wife will ban them!!! Started buying more ... and more ... and more ... and now I question the value of having a car parked in a garage, so much space for a track. and i also have a 9.5m home track. Army is moving me back to Brissy and I plan on being a Northsider again (all my pre-army life and half of my current service has been northside). My daughter and I race in a parent/child comp every weekend here in Canberra. 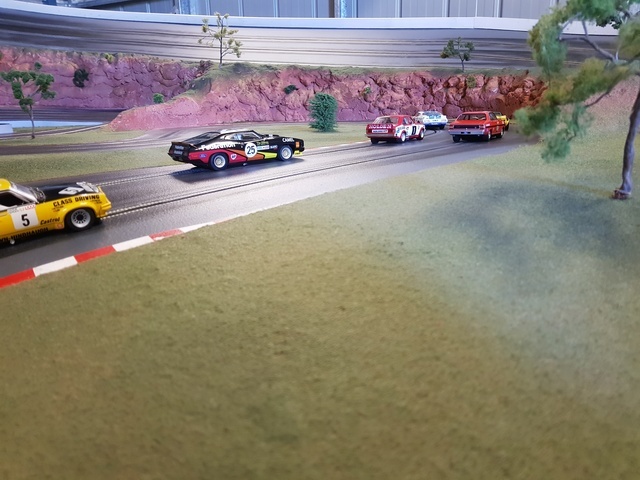 Currently we race analog SCX GT and NASCAR in our comp.